Blunt trauma chest resulting in tracheobronchial injuries (TBI) are rare in children. The cause could be high impact blunt trauma, penetrating injury or iatrogenic during bronchoscopy. , We report a case of bronchial rupture sustained in a road accident. Early diagnosis and surgical treatment is emphasized. An 8-year-old girl presented six hours after a road accident. She had been crushed underneath an agricultural tractor trolley. The patient had developed rapidly progressive dyspnea. Her respiratory rate was 80/ min, heart rate was 130 beats per min and the radial pulses were impalpable. The blood pressure and SpO 2 could not be recorded. The limbs were cold and clammy. The air entry was absent on right chest and the percussion note was resonant. She was resuscitated with IV fluid boluses, and a quick tube thoracostomy. She was kept in propped up position with moist oxygen supplementation. Despite this, her condition continued to deteriorate. There was massive air leak through the tube. SpO 2 did not increase beyond 50%. 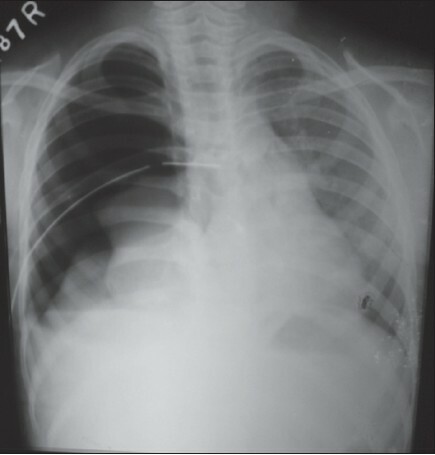 The chest radiograph showed right pneumothorax with collapsed lung [Figure 1]. The lab investigations showed Hb of 13 gm%, PCV 38 and normal electrolytes. A tracheobronchial injury was suspected clinically and the patient was taken up for urgent thoracotomy in view of rapidly deteriorating condition. In the operating room, under general anaesthesia a rigid bronchoscopy was done to locate the suspected airway injury. It revealed a tear in the right intermediate bronchus. No active bleeding was seen. Left side airway was normal. The sheath of the bronchoscope was introduced into the left main bronchus under vision and the telescope was withdrawn. A lubricated stiff stilette (tube exchanger) was passed through the sheath into the left bronchus. The sheath was exchanged with an appropriate sized endotracheal tube by the Seldinger technique resulting in left bronchial selective intubation. With this the oxygen saturation improved to 90%. A right posterolateral thoracotomy was performed through the 5 th intercostal space. The right lung was found to be completely collapsed and a tear was found on the right intermediate bronchus. The tear was almost 1.5 cm long, had irregular margins. The lower lobar bronchus had completely severed from the bronchus. The tear was extending into the middle lobe. The pulmonary artery in the fissure was intact. The rigid bronchoscope was used to visualize the proximal anatomy through the tear. It revealed an intact upper lobar bronchus. It was not possible to repair the defect as it was extending within the middle lobe. Hence, a right lower and middle lobectomy was performed. The upper lobe was thus saved and the stump was closed with intermittent 4-0 prolene sutures. The suture line was reinforced with mediastinal pleura. Thoracotomy was closed with an intercostal drainage tube. The patient was extubated on table. The postoperative recovery was uneventful and the patient was off oxygen after 48 hrs. The postoperative chest radiograph showed satisfactory expansion of the right upper lobe and the chest tube was removed on 5 th postoperative day. Blunt trauma resulting in TBI is rare, in children. , In addition to clinical and radiological evaluation, early bronchoscopic evaluation in suspected cases confirms the diagnosis. In our case, the suspicion of bronchial rupture was confirmed with the bronchoscopy performed in the operation room. It was also helpful in positioning the endotracheal tube in the uninjured opposite bronchus, so that air leak could be minimized through the defect. This is an important aspect to improve oxygenation and maintenance of optimum oxygen saturation during the procedure. Also it made the operation easier as the entire lung remained collapsed during the surgery. Further no blood or secretions entered the left bronchus through the right sided rent. Cases with intact peribronchial tissues and those with tears less than 2 cm have been reported to be managed conservatively. , However, the main option remains surgery. , Airway control bypassing the tear or selective intubation of the uninjured side helps in better intraoperative view and patient management. The literature shows that in the acute setting, majority of the cases can be tackled by suture closing , the tear but a few may require lobectomy or pneumonectomy. Lobectomy is usually resorted to when the lobar bronchi are damaged beyond repair. Cases of TBI usually require a tailored approach. The authors wish to thank the anesthesiologist's team (Dr. Anju Bhalotra and Dr. Nishant) for their excellent anaesthetic management of this case and also for reviewing the manuscript. 1. Gabor S, Renner H, Pinter H, Sankin O, Maier A, Tomaselli F,et al. Indications for surgery in tracheobronchial ruptures. Eur J Cardiothorac Surg 2001;20:399-404. 2. Hood RM. Injury to the trachea and major bronchi. In: Hood RM, Boyd AD, Culliford AT, editors. Thoracic Trauma. Philadelphia, PA: W.B. Saunders Company;1989. p.254-66. 3. Mordehai J, Kurzbart E, Kapuller V, Mares AJ. Tracheal rupture after blunt trauma in a child. J Pediatr Surg 1997;32:104-5. 4. Gaebler C, Mueller M, Schramm W, Eckersberger F, Vecsei V. Tracheobronchial ruptures in children. Am J Emerg Med 1996;14:279-84. 5. Baumgartner F, Sheppard B, de Virgilio C, Esrig B, Harrier D, Nelson RJ, et al. Tracheal and main bronchial disruptions after blunt chest trauma: Presentation and management. Ann ThoracSurg 1990;50:569-74. 6. Meyer M. Iatrogenic tracheobronchial lesions: A report on 13 cases. Thorac Cardiovasc Surg 2001;49:115-9. 7. Slimane MA, Becmeur F, Aubert D, Bachy B, Varlet F, Chavrier Y, et al. Tracheobronchial ruptures from blunt thoracic trauma in children. J Pediatr Surg 1999;34:1847-50. 8. Heldenberg E, Vishne TH, Pley M, Simansky D, Refaeli Y, Binun A, et al. Major bronchial trauma in the pediatric age group. World J Surg 2005;29:149-53. 9. Gwely NN. Blunt traumatic bronchial rupture in patients younger than 18 years. Asian Cardiovasc Thorac Ann 2009;17:598-603. 10. Singh N, Narasimhan KL, Rao KL, Katariya S. Bronchial disruption after blunt chest trauma chest. J Trauma 1999;46:962-4. 11. Jamal-Eddine H, Ayed AK, Peric M, Chandrasekaran C, Al-Sarraf N. Complex bronchial ruptures successfully treated with primary reconstruction and limited lung resection. Gen Thorac Cardiovasc Surg 2009;57:261-3.